Shortly after NCLB was passed in 2001, Public Education Network (PEN) began an intensive examination of the law to determine the rights and privileges it accords to parents and community members. Approximately 10,000 print copies of the resulting publication, "Using NCLB to Improve Student Achievement: An Action Guide for Community and Parent Leaders", have been requested by organizations throughout the country, with more than 40,000 copies downloaded from the PEN website. In addition, a series of NCLB action briefs, developed by PEN in partnership with the National Coalition for Parent Involvement In Education, have been downloaded more than 25,000 times. With this demand for information on NCLB as background, PEN held a series of state hearings to give the public a structured way to enter the debate on the pros and cons of NCLB and the effects, both positive and negative, the law is having on schools and students. Nine hearings took place in eight states over a five-month period. Each state hearing was conducted in partnership with local organizations and presided over by a panel of state and national hearing officers. PEN hopes these forums broadened the public debate about NCLB and provided policymakers with information on how their work encourages or discourages quality education for children. 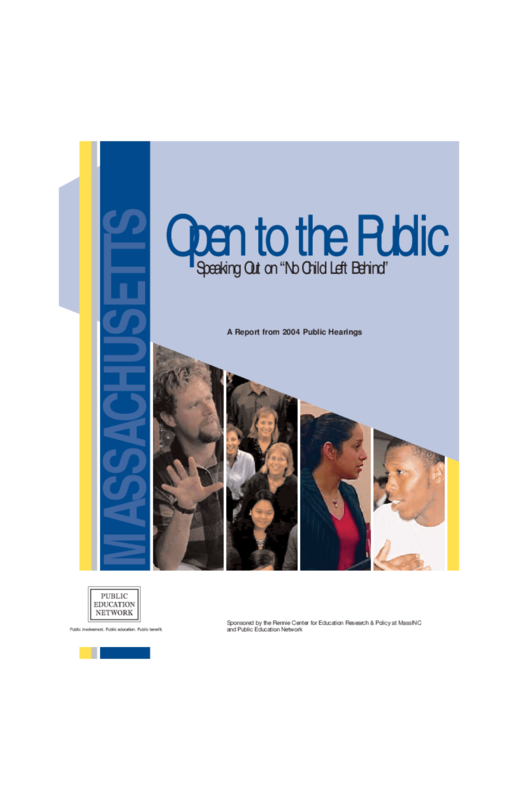 The findings from PEN's NCLB hearings were transmitted to decision makers at the national, state, and local levels to help them determine which aspects of NCLB the public supports, what are the primary concerns, and what mid-course corrections are needed to achieve the most beneficial results for all students.